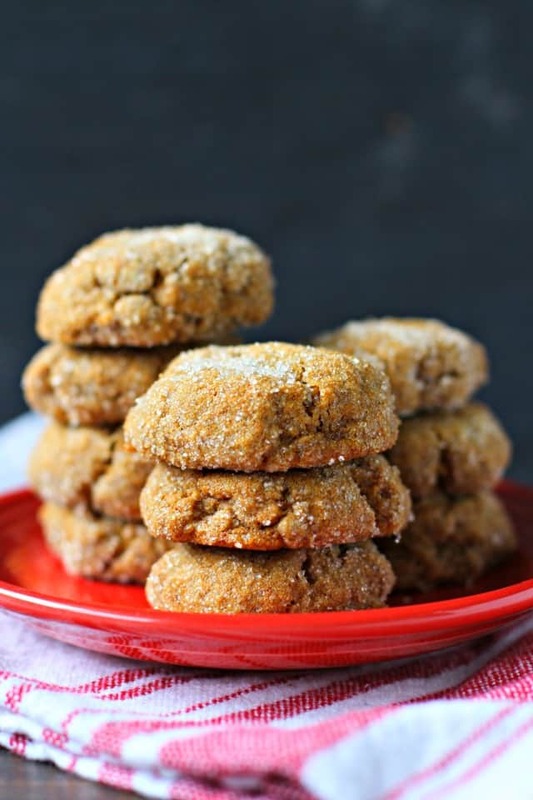 Home » Desserts » Chewy Pumpkin Spice Molasses Cookies (Gluten Free, Vegan). Is there a dessert or treat that you realllly missed when you went gluten free? For me, that treat was a molasses cookie from Starbucks. Those cookies were perfectly chewy and spicy, and I loved them. Well, I’ve come up with a delicious substitution for those Starbucks treats – these gluten free pumpkin spice molasses cookies. 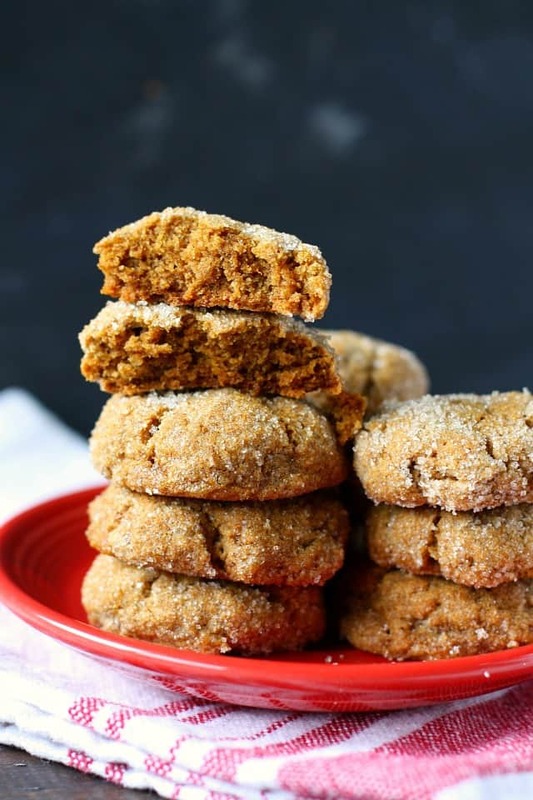 These pumpkin spice molasses cookies are my new favorite fall treat. They are soft, chewy, and so perfect with tea or hot cider. The best part is, these cookies work really well with many brands of gluten free flour. This time, I made them with the Namaste Perfect Flour blend, and the recipe yielded very chewy, soft cookies that my kids loved. Roll the dough into balls, and roll those in a bowl of granulated sugar. 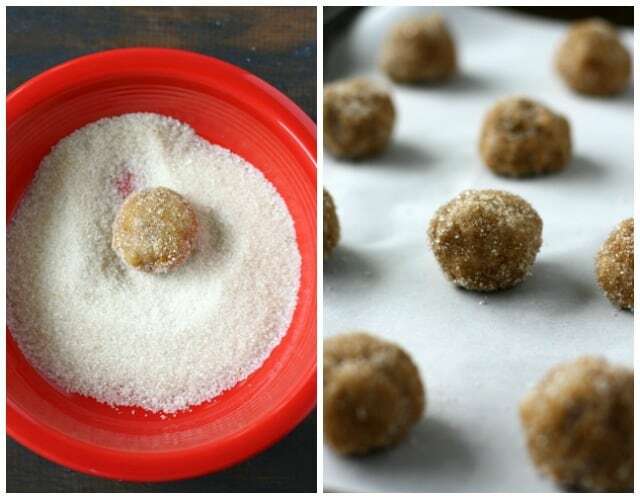 Place the sugar-coated balls on a baking sheet. Flatten slightly with your hand. What makes gluten free cookies dry, or gummy, or hard? Different gluten free flours absorb more or less liquid than others. If you follow this recipe and the dough seems unusually wet or dry, you can add a little more pumpkin puree, or more flour if the dough is too wet. If your gluten free baked goods are turning out hard or tough, you may be over-mixing the dough. Just mix until combined so the dough doesn’t get tough. 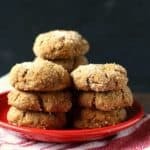 Perfectly soft and chewy gluten free pumpkin spice molasses cookies are a wonderful treat for fall! In a medium sized bowl, whisk together the gluten free flour, cinnamon, ginger, nutmeg, cloves, baking soda, and salt. Set aside. Cream the vegan buttery spread and sugars on medium speed until light and fluffy. Add the molasses, vanilla extract, and pumpkin puree and mix until smooth. Add the dry ingredients to the wet ingredients a little at a time while mixing together on low speed. Pour a few tablespoons of sugar in a small bowl. Form balls of dough about one inch in diameter and roll in the sugar. Place the balls on the lined cookie sheets and flatten them slightly. Bake at 350 degrees for 10-12 minutes. Do not overbake. Let cool for a few minutes on the baking sheet before moving to a wire rack to cool completely. Repeat with remaining dough. Makes about 24 cookies. These cookies should work well with most brands of gluten free flour. My recipe for gluten free flour blend works well, too. If you aren't gluten free, you can use regular flour. If you aren't dairy free, go ahead and use regular dairy butter. You should be able to freeze this cookie dough if you like. Scoop onto a cookie sheet, and freeze for one hour, then store the cookie dough balls in a freezer bag. You can store in the freezer for up to 3 months. This recipe was originally published in October 2015. It has been updated with new photos and text. my ebooks // pinterest // facebook /? « Vegan Cheesy Baked Kale Chips. Hi can you use oil in place of the butter? If you can’t do butter or buttery spread, I would recommend palm shortening. Hi Kelli….I just made your no-bake sunbutter granola bars from your cookbook and after the 2 hours of letting set before cutting, they are still soft. Yours in the picture of your cookbook, look hard like granola bars. Should they be? Can you try refrigerating them before cutting them? That will help them set. These are making my mouth water, and you officially have me thinking about pumpkin! 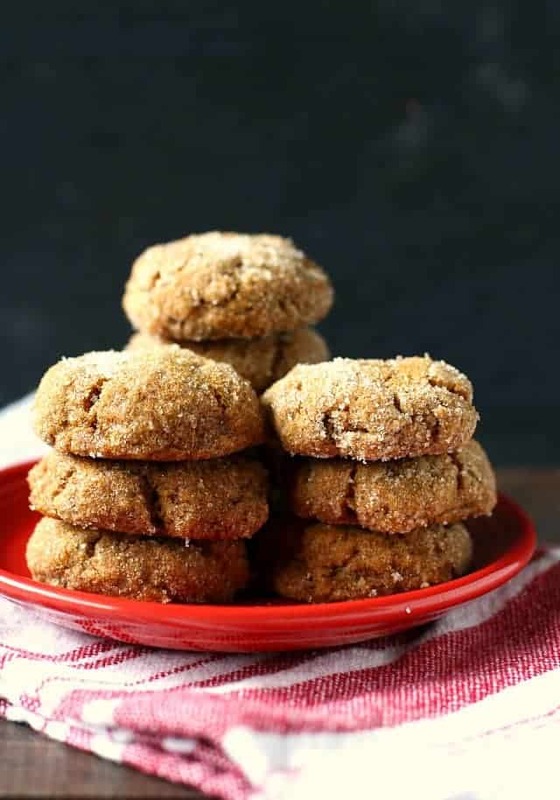 Love me some molasses cookies – I’m anxious to try these soon! Those look yummy….great recipe, but right now, I’m not suppose to have pumpkin. I’m still in the food allergy process of adding things back in slowly. I’m so excited, as yesterday I added oats back in and so far, so good. Hard to tell when I have daily headaches still, but no other adverse reaction. In fact, I went straight to your cookbook I bought to see all the OAT recipes you have in there that I couldn’t make before. I’m excited to get to try them. But right now I can only have oats once a week, not to overdue. Thanks for this blog. It really has helped me for my adult kids when they come home with allergies and then for myself now, just finding out in the last year more foods I can’t have. I miss the Starbucks cranberry bars when they come out at Christmas time and I REALLY miss the pumpkin spice latte’s. Maybe some day. You could try these with sweet potato puree, if that works for your dietary needs! I picked up some molasses and pumpkin at TJ’s because…fall!! ? and then I hit up pinterest to find some recipes. I started making this recipe and then realized there was no egg in it (gfdf not vegan). I was nervous about that BUT these are AMAZING. I use the mix from “cooking for Isaiah” thanks for a yummy fall recipe!! Yay! So glad you liked these! Thanks for letting me know. Will this turn out using normal butter? SIMPLY DIVINE – these are fall wrapped into a chewy, soft cookie! I’ve made two batches in 2 days and the real seal of approval is that my toddler (who’s not necessarily a picky eater – though he is ana to dairy, eggs & nuts) loved them! I’ve made at least 4 other allergy-friendly cookies over the years and he’s never really taken to any. These were the first homemade ones that he’s been crazy about – and I love that! THANK YOU for this recipe! I’m so glad these were a hit! Thank you so much for sharing, that made my day! Finally, success! I’m a long time baker, but have been struggling with gluten free and vegan baked goods for the last few months after discovering my daughter’s allergies. To top it all off she’s also allergic to xanthan gum so I can’t use that either. I can’t use any of the 1:1 gluten free mixes because they almost all contain xanthan gum, so I make my own. It’s a recipe from America’s Test Kitchen and the recipe can be found here https://www.cooksillustrated.com/recipes/7854-americas-test-kitchen-gluten-free-flour-blend . The only change I made to that flour recipe was using powdered coconut milk in lieu of the non-fat milk powder. In place of the xanthan gum, I used psyllium husk fiber. If using that, you will need to use 2 times the amount than you would if using xanthan gum. So for each cup of flour you use, you would add 1/2 teaspoon of psyllium husk. The only other thing I did different was rest the dough in the refrigerator for 30 minutes before working with it. The dough gets warm and mushy quick, so work fast! They came out wonderful, moist, and just delicious. Thank you for posting this! ? Thank you so much for letting me know! And I appreciate your detailed comment, that will help other readers! These were very dry, and tasted gluten free. I probably won’t make them again, but will keep looking for another recipe that is similar or try to revamp this recipe. Hello! I’m sorry you didn’t like them. Maybe you overbaked them? I just baked these again yesterday and used Namaste GF flour this time and they were very moist. I made a cinnamon apple french toast strata for the family last week. I think I’ll have to treat myself this week with these! Wow- I too agree, this has my heart!! It looks so delicious I am pinning to try when I get some time!! Thanks! These look fabulous- I love that they are both vegan and gluten free! What a perfect cookie for fall! Now that it’s October, I want to put pumpkin in EVERYTHING! Thank you so much Ginger biscuits sound really good! Sounds like a super productive weekend! I need to follow suit with projects around the house, and do some holiday decorating. These cookies look like perfection! I’m always up for a pumpkin treat and the molasses is calling to meeeee! These cookies look like little pillows of heavenly goodness. Molasses cookies are my ultimate weakness this time of year! But throwing pumpkin into th emix too?? Well, twist my arm why dontcha.. ;) These look just perfect, Kelly! I wish I could reach right through my screen and grab a few of these cookies, Kelly! I can;t get over how thick and chewy these are! Pumpkin and molasses sound like the best combo!